Intraperitoneal fluid accumulation is called ascites, which causes an increase in abdominal volume, weight gain, abdominal pain, and shortness of breath; different causes have been identified for ascites, including chronic heart failure, cirrhosis, chronic kidney disease, intra-abdominal malignancies, and tuberculosis. Intraperitoneal fluid aspiration (paracentesis) is the main way to detect the cause of ascites; this intervention is carried out in two ways: traditional and under ultrasound guidance. Traditional paracentesis requires clinical skill. Medical students can increase their clinical and communication skills using a variety of teaching aids, models, and medical simulators in the Clinical Skills Centers. In various studies, the effect of practical training on simulators was compared with patients, and it is specified that using simulator-based methods had better results. In most cases, the lumbar puncture (LP) training on a simulator was taken initially in 1994, and in a study, students who were trained on the LP simulator had better practical test results than the video tutorial group under the website. In the year 2003, a simulator for intra-articular injection was introduced. In a similar case, a paracentesis simulator model was created and used in education. In Iran, studies have been conducted based on the using of foreign simulators and have been compared solely with educational methods. In two separate studies, the practical results of cardiopulmonary resuscitation test were studied in two groups of students that training on simulators and traditional education group through lectures and educational films. Finally, the use of simulator for rehabilitation education was accepted. In another study, a group of students who trained the process of tracheal intubation on simulators had higher scores of practical tests than those who did not receive this training. Sanctions, high prices of simulators, and lack of annual education budgets are the most problems in Iranian universities. 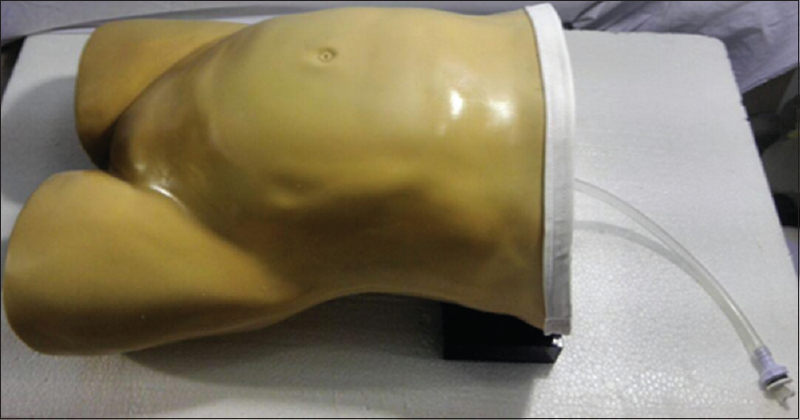 The goal of this research was to design an Iranian simulator for examination and paracentesis of ascites. We attempted to create a variety of features in simulator such as appropriate appearance, size, anatomy, surface markers for best catheter insertion, and doing ascites examinations including “fluid wave” and “shifting dullness.” Then, the final simulator [Figure 1] was transferred to the clinical skills center of Isfahan University of Medical Sciences and was examined by the experts. After several stages, the defects of the final product were completed and confirmed. One of the challenges of the study was to determine the materials used to make mannequins. These materials should be cheap, affordable, and safe and had good quality. We tested different materials. Finally, we used silica, latex, and foam combinations for this purpose. Furthermore, the consistency and reduction of the leakage from the needle entry site were also a challenge to the design, which after the combination of several material types, internal fluid bag was made of materials that have the least damage in student's frequent tests and economically feasible to replace with low cost. This mannequin has three main parts. The first part is a silicone skin that covers the entire surface of the mannequin. This skin is very flexible and has the same color as the human skin. Repeated use of Intravenus line catheter can cause skin damage, but the use of silicon has solved this problem. The second part is a large piece of red foam. This part actually plays the role of the intra-abdominal muscles and viscera. The third part is a large silicone-latex bag. This bag is the peritoneal space that is filled with water through a hose. The volume of this bag is about 10 L and is covered with a layer of silicone glue. This adhesive layer reduces the leakage of liquid out of the bag. The authors would like to thank Dr. Tahereh Changiz and Dr. Nikoo Yamani. This study was financially supported by the Deputy of Research of Isfahan University of Medical Sciences (grant). Pericleous M, Sarnowski A, Moore A, Fijten R, Zaman M. The clinical management of abdominal ascites, spontaneous bacterial peritonitis and hepatorenal syndrome: A review of current guidelines and recommendations. Eur J Gastroenterol Hepatol 2016;28:e10-8. Merck Manuals Professional Edition. Ascites – Hepatic and Biliary Disorders; May 2016. Available from: https://www.msdmanuals.com/professional/hepatic-and-biliary-disorders/approach-to-the-patient-with-liver-disease/ascites. [Last retrieved on 2017 Dec 14]. Moorthy K, Jiwanji M, Shah J, Bello F, Munz Y, Darzi A, et al. Validation of a web-based training tool for lumbar puncture. Stud Health Technol Inform 2003;94:219-25. Waikakul S, Vanadurongwan B, Chumtup W, Assawamongkolgul A, Chotivichit A, Rojanawanich V, et al. Aknee model for arthrocentesis simulation. J Med Assoc Thai 2003;86:282-7. Tzafestas CS, Birbas K, Koumpouros Y, Christopoulos D. Paracentesis modeling and VR-based interactive simulation with haptic display for clinical skill training and assessment. Proceeding of the International Conference on Integrated Modeling & Analysis in Applied Control & Automation (IMAACA'2004) (Special Session on: Virtual Reality and Haptics for Modeling, Design and Interactive Simulation. 13M: International Mediterranean Modeling Multiconference. Genoa, Italy: International Mediterranean Modeling Multiconference; 28-31 October, 2004. Khoshab H, Seyed-Bagheri H, Sabzevari S, Nouhi E. Comparison of the effect of traditional and mannequin-based simulation teaching of cardiopulmonary resuscitation on knowledge and practice of emergency medicine students. J Med Educ Dev Center 2016;13:298-306. Khazaei T, Makhmalbaf G, Sharifzadeh G. Comparing two methods of teaching ventilation skills, laryngoscopy and tracheal intubation, in anesthesiology students. Iran J Med Educ 2010;9:225-30.